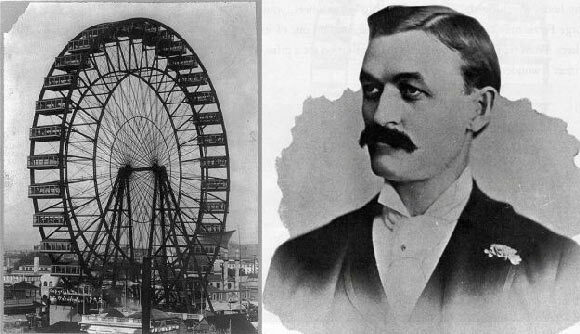 George Ferris (officially George Washington Gale Ferris, Jr.) was an American engineer best known for inventing the Ferris Wheel. He was born on February 14, 1859 in Galesburg, Illinois. When he was five years old, the family moved to Nevada. At the age of 16, Ferris left Nevada to attend the California Military Academy in Oakland. He graduated in 1876 and then left for New York to attend Rensselaer Polytechnic Institute. Here he earned a degree in Civil Engineering in 1881. After graduating, Ferris joined the railroad industry and showed a marked interest in building bridges. He founded his own company by the name of G.W.G. Ferris & Co. in Pittsburgh, Pennsylvania. When Ferris heard about the World’s Columbian Exposition to be held in 1893 in Chicago, he became interested and went there. Before the event, one of the Directors, Daniel H. Burnham, expressed a desire to build something wonderful as a tribute to the upcoming fair. His aim was to rival the Eiffel Tower, which had originally been built as the entrance arch to the 1889 World’s Fair held in Paris. Burnham said he wanted something “original, daring and unique” to be built, something that would make an immediately favorable impression. Ferris liked this idea, and proposed the building of a gigantic wheel. Originally called an observation wheel, it was meant to provide a birds’ eye view of the entire city. Ferris’s original idea was met with rejection. The planning committee said it would be too costly and possibly too dangerous to be allowed. Despite the committee’s rejection, Ferris was undeterred. He took his plans to all major architects in Chicago and convinced them to back him up. He got them to review his plans and vouch for the safety of the intended structure. He also arranged for financing up to the amount of $400,000. The committee reevaluated their decision and Ferris was given the go ahead to begin construction. However, because such a massive project had never been undertaken before, construction ran behind schedule and the wheel wasn’t completed until a month and a half after the Fair was officially inaugurated. It was an impressive structure, standing right in the middle of the ground. The axle alone weighted more than 47 tons and stood 150 feet tall, while the wheel itself was 264 feet tall. It was the single largest piece of steel to have been made in the U.S. and cost approximately $750,000 to make. The wheel had 36 cars and each car had the capacity to hold between 40 to 60 passengers for a ride that lasted 20 minutes. The first passengers to ride the wheel were Ferris and his wife, the Mayor of Chicago and a marching band. It ran smoothly, without any technical or safety issues. Passengers were charged 50 cents each for a ride on the wheel and by the time the fair was over, it was estimated that roughly 1.5 million people had been on it. After the fair closed, Ferris sued the management as he felt he was not given his fair share of the profits but he lost the case. While the litigation was ongoing, replicas of the wheel began springing up in amusement parks all over the country, particularly at Coney Island, New York. Ferris died in November 1896, a few months after his wife left him. The cause of death was typhoid fever. He was 37 years old at the time of his death and facing bankruptcy. He was cremated but his ashes remained uncollected for more than a year. His name was added to the Rensselaer Polytechnic Institute Alumni Hall of Fame in 1998.